Maybe it's because I was an English major in college, or maybe it's because I've been an illustrator for so long that all I know how to do is draw in response to text, but I almost always start my prints with words. Often times the words change as I work through the prints, but the words are always there running alongside the images in my mind. 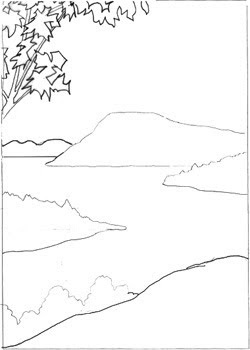 The drawing above is the basic placement I've worked out for the "Vast Unpeopled Lands" print. I'm waiting for some really large shina from McClain's to arrive before I start in earnest on this one. After several weeks packed with illustration work, this week I've had a couple of days back in the studio. I've spent most of that time working on sketches for the next couple of prints. Nothing to show you yet, but I can tell you that I'm planning 6 or 7 new prints in the Pilgrim series. These next prints will tell the story from the Native American point of view. In the early 1600s, the area now known as New England was heavily populated by a number of native peoples. In fact, French explorer Samuel de Champlain reported on his first visit to Massachusetts that it was too populated to successfully colonize. The people of eastern Massachusetts that the Pilgrims had the most contact with were the Wampanoag. 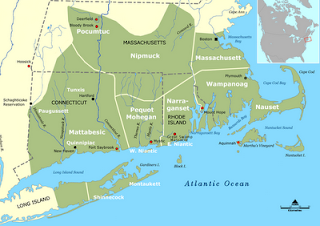 Here's a map showing the basic tribal nations of Massachusetts (click to see a larger view). If you'd like to know more about the history of the Pilgrims and the Wampanoag, I highly recommend watching the first episode of the PBS series "We Shall Remain." Episode 1, called "After the Mayflower," can be viewed in its entirety on the web site. I'm so happy to be back in my moku hanga studio! Regular readers of this blog know that the Japanese method with its waterbased pigments, brushes and hand printing tends to produce softer and more painterly relief prints than western methods. This two-day workshop will focus on the printing aspect of the Japanese method of woodblock rather than the carving. Using just two or three very simple carved blocks, students will explore the great variety that can be achieved by varying the printing methods. The workshop is open to beginners as well as students who want to expand their relief printing practice. If you live in the U.S. it's gotten kind of hard to ignore the ruckus about health care that's taking place, complete with gun-toting Americans on television going on about "socialism," or even worse, "Hitler" and "Nazis." I try to keep my blog posts art related, so I've studiously stayed out of the fray, but today I remembered: artists need health care! This morning I collected a few nuggets of information about health care and artists (all types included: musicians, performing artists, visual artists, writers, etc.) and posted my findings to Twitter. Thought I'd collect the info here as well. 1. Employment-based health care, as we have in the U.S., fails to serve artists, who are 3.5 times more likely than the general population to be self-employed or employed part time (i.e. the famous "day job"). 2. An estimated 40% of artists lack health insurance. Given that artists typically earn $6,000 less annually than other "professional" workers, artists often can't afford individual premiums. 3. A Future of Music Coalition report finds that artists are considered by insurance companies to be a "risky" population. I can only speculate what that's all about, but my best guess is that it's an anti-arts bias based on a perception best stated by the new NEA chairman Rocco Landesman in a recent NY Times article: "The arts are a little bit of a target. The subtext is that it is elitist, left wing, maybe even a little gay." The good news is, artists know how to get together and fight back. A Twitter acquaintance of mine, artist Sky Pape (see her moving series of drawings called "Keening" about the illness and death of her sister), wrote a blog post that vividly reminded me of the 1980s when AIDS was decimating the arts community. Back then, individual artists as well as groups like Act Up fought the Reagan administration to get some help and funding. Artists, let's use our power to get the attention back on making health care available to everyone. Artists, let's use our creativity to touch hearts and make powerful statements that can drown out the memes of fear and prejudice that are dominating the debate. Artists, let's get ourselves some good old all-American health insurance! And please, if you're an artist, leave me a comment about where your coverage, if any, comes from. I've been swamped with illustration work lately so I haven't been doing any printmaking, or blogging for that matter. But this weekend Lynn and I will be celebrating our 5th wedding anniversary and I wanted to show you this year's installment of the print series I call Sometimes I'm Married. I worked on this print during the moku hanga workshop I taught last month. As I explained last year, I think of these prints as a gradual reduction series examining the state of my marriage. I plan to revisit this print every year around our wedding anniversary until all the states are one color. A reduction print is a print created by cutting a block, printing it, then cutting some more and printing again. In this series the gold block stays the same, but the overprinted blue block will be gradually reduced. At least that was the plan, but then came California. Because I had carved away California in 2008 (since at that point we were legally married there), the passage of Proposition 8 making gay marriage once again illegal in California ruined my plan. I had to put California back. Which meant I had to re-carve the blue block. California is a conundrum. I read somewhere that same-gender couples who are married in other states might be married in California too as long as they were married before Proposition 8 was passed. But nobody seems sure about that. I'm optimistic, so I made California striped to signify that we might be married there. Despite the California seesaw, the Northeast is positively glowing with gay marriage (no wonder I love it here) and, well, Iowa was an awfully nice surprise. Yay Iowa! Here's the series so far. One of the most daunting tasks I've faced as I've learned the intricacies of Japanese woodblock printmaking is re-wrapping a traditional baren when the bamboo covering wears out, which it inevitably does. Many of my moku hanga colleagues have expressed similar concern over this task and have looked for a resource for clear instruction. I've watched Matt Brown do it several times and he kindly re-wrapped my Murasaki baren this past spring when I assisted at his class at Snow Farm, but I still have felt daunted about doing it myself. Moku hanga aficionados, worry no longer! 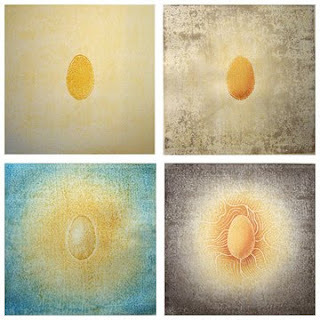 Moku hanga artist Ryusei Okamoto has come to our rescue! Ryusei has added a page to his web site that shows complete step-by-step photographic instructions on wrapping a baren. Thank you, Ryusei san! Worcester Art Museum is a quiet little gem of a museum that I recently discovered here in western Massachusetts. On display now through October 18 Printmaking Methods/Relief is the fifth in a series of installations explaining the techniques of printmaking. This exhibition considers the relief processes, including woodcuts, wood engravings and linocuts from around the world. ocean in front of the Mansion, too. And in Bristol, Vermont, you can see 22 woodcuts by Ray Hudson through the month of August at the WalkOver Gallery on Main Street. 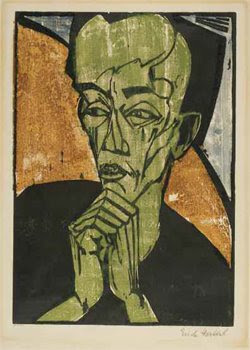 Hudson works with a Chinese method of woodblock printing, using woodcuts as a kind of paintbrush in a technique called shui Yin, or water printing. His prints look very painterly and rich. Summer is short in New England, so enjoy!